Can you tell us a bit about the locations used in the film? We used a period house in Kent called Penshurst Place which is where we did the execution of Mary. We used Blackness Castle for the majority of the exterior of Holyrood scenes that you see in the film. The film’s basically divided into two in terms of story and location: there’s the world of Elizabeth and then there’s the world of Mary and the only times they come together is the scene in the cottage. The scenes with Elizabeth were all shot in England at Hardwick Hall, which was part of Hampton Court Palace, and Haddon Hall, which was the interior of Hampton Court Palace. Then in Scotland, which is the world of Mary the look is quite contrasting; it is harder. Most of Mary’s world is at Holyrood Castle which was a combination of sets at Pinewood and a castle near Edinburgh called Blackness. There’s quite a lot of big Scottish exteriors of Mary and her army on the march, arms coming ashore. That was all done at Scotland in various places, one of which was Glencoe. For the beaches we used North beach near Edinburgh. There’s a scene where Mary and her ladies-in-waiting are on the beach and that was in Seacliff. A lot of the other exteriors, the Highland exteriors we shot a day at Glencoe and at an estate called Glenfeshie near Aviemore. There’s a big battle scene where Mary’s army stage an ambush on a bridge. That was at a bridge near Aviemore. The church where Knox was preaching was at a very beautiful church called Albury in Surrey. The gallery in Hampton Court was a combination of Haddon Hall in Derbyshire and Gloucester Cathedral. The crypt at Gloucester Cathedral we also used as the cell where Mary is held prior to her execution. At the Chiltern Open Air Museum we used one of the barns as the cottage for the meeting between Elizabeth and Mary. What was it like filming in Scotland? It was great. 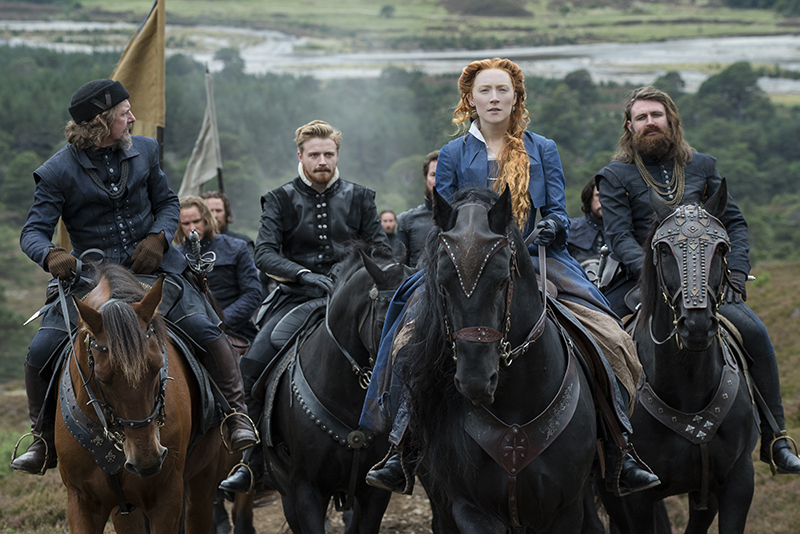 It was very challenging because Mary Queen of Scots is quite a big film. It comes with a lot of people and a lot of gear that is quite difficult to move around in some of the settings we used. There was a lot of moving around as well. It can take quite a lot of planning. But it was good fun. Scotland is a great place to film. The Highlands are incredibly beautiful.The beaches were pretty spectacular. It gave a really good natural scale to the film. Was it challenging finding locations for a historical film? We looked into some of the real locations but some weren’t very practical because the areas aren’t quite the same as they were back then. Hampton Court and Holyrood are very different to what they would have been at the time. We tried to create a world that reflected the characters rather than an exact architectural replica of every place they would have been in in reality. The production designer wanted to create a certain atmosphere for the interior of Holyrood so that meant we needed a certain type of exterior. We wanted to show a bit of a contrast between Elizabeth and Mary’s world. Elizabeth’s life is relatively comfortable in that she’s the reigning queen and she lives in a palace, whereas Mary comes ashore on a windswept craggy beach and her life contrasts very markedly with Elizabeth’s. We see her outside in The Highlands at the head of an army in challenging environments. It’s quite important to convey what’s going on with the characters rather than an architectural documentary. What did your job involve? My job has two parts. The first part is quite creative. Myself, the production designer and the director will have lots of conversation about the locations and what they have to provide in terms of character and atmosphere. My job is then to find those locations. It involves a lot of driving around. Once the locations have been selected, my job becomes more logistical – how do we get a 250-man crew and all the gear and all the trucks into some of these locations. I thought Haddon Hall was beautiful. There was a fantastic bridge in the middle of nowhere in the Highlands where we filmed the ambush and that was one of my favourite locations. Sometimes the best locations aren’t necessarily the grandest. I loved Gloucester Cathedral. The cloisters looked phenomenal. All the locations were pretty impressive on Mary Queen of Scots. It’s pretty hard to be in the Highlands and not be impressed by the natural splendour of it all. It’s a good film location wise. What should audiences look out for in terms of locations in the film? The awe-inspiring exteriors that we used in the Highlands. All the scenes of Mary’s army on the march are really spectacular.